May Botanical tapestry shows the flowers in bloom in May, from the work by English botanist Robert Furber. Here we see the flowers of late spring in an ornate silver and gold vase, with some blooms on the classic ledge below. Furber created a book of plants and seeds in 1730, called Twelve Months of Flowers, and this publication featured many flower species over the 12 months of the year. Each flower type was labeled with a number and its name listed below the floral collection. 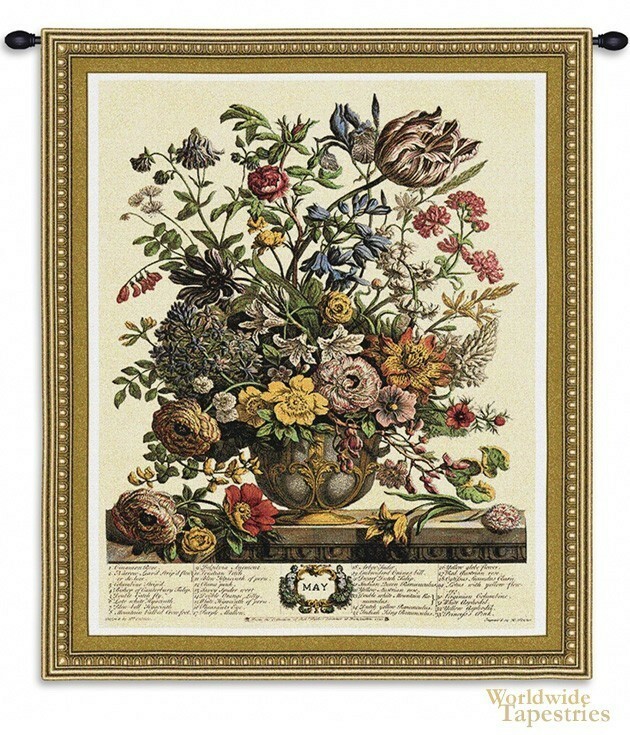 May Botanical tapestry has a lining and a rod tunnel for easy hanging. Note: Tapestry rod and tassels, where pictured, are not included in the price.